Flowers - Katie & Paul's Big Day! Katie & Paul's Big Day! 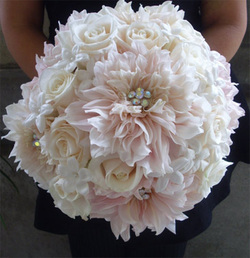 My bouquet will be somewhat similar to this. It will be round with dahlia, stephanotis, and hydrangea. 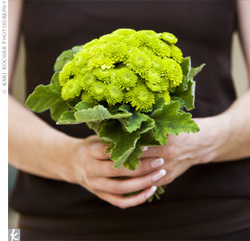 My bridesmaid will carry a bouquet of green pom flowers aka Yono Ono flowers. 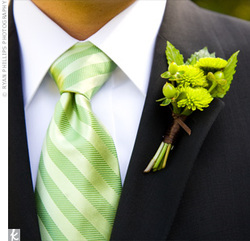 I love these flowers as the vibrant green will really pop against the deep purple BM dresses. 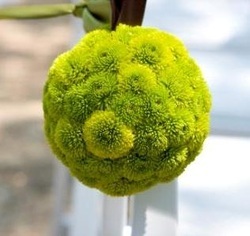 My niece Katelyn is a junior BM and will carry a pomander (kissing ball) of green poms. 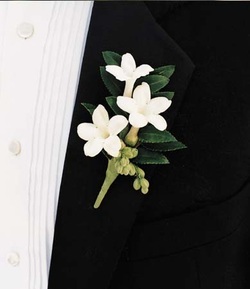 Love the simple boutonniere of white stephanotis. So elegant. His boys and the fathers will wear these. Love it! 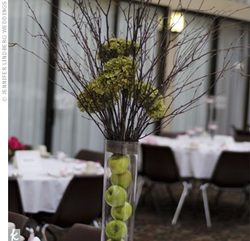 I love tall centerpieces with manzanita branches. We will have alternating tables with a centerpiece similar to this. We'll use the granny smith apples, purple flowers, and hanging votives. The other tables will have a shorter centerpiece with the apples and same flowers.